Servicing your vehicle on a regular basis pro-actively maintains the running of your car helping to reduce the risk of breakdown. It also helps to reduce vehicle emissions and improve fuel efficiency. Most manufacturers recommend servicing at least every 12 months. We offer convenient menu pricing for interim and full servicing, dependant on the engine size of your vehicle and the type of oil it requires (specifications as recommended by the manufacturers). We only use high-quality oils and all parts used are manufactured to Original Equipment (OE) standard. Please call us to discuss the service requirements for your car as some vehicles may have a slightly different price from the fixed price menu. HC MOT & Service can repair and service all makes and models of vehicle. All our Technicians at HC MOT & Service are fully qualified to carry out a full and comprehensive service on your vehicle. We can just about fit any size of tyre, we have invested in a state of the art tyre fitting and balancing machine here at HC. If your car needs a tyre, please call us to request a price, we are very competitive on price and can generally get your tyres fitted on the same day. We can also carry out puncture repairs to your tyres which will save you money on replacing the tyre. Use our guide on the right to see how good or bad your tyres are or just call in and we will give you an honest opinion on your tyres. Many vehicle manufacturers recommend replacing your tyres at 3mm. 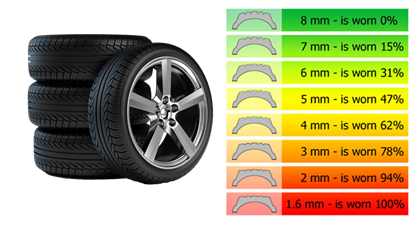 At 1.6mm in wet weather, it takes an extra two car lengths to stop at 50 mph than if your tread was 3mm. That can make all the difference if you not to stop in a hurry! DID YOU KNOW THAT AN ILLEGAL TYRE CAN BE A £2500 FINE & 3 PENALTY POINTS PER TYRE! Here at HC MOT & Service we carry out MOTs on Class 4 vehicles. Class 4 is any vehicle up to the weight of 3 metric tons. Class 4 also includes Pickup Trucks, Motor Homes SWB Van’s and privately owned Mini Buses, please call us to confirm if your vehicle is a Class 4. The current MOT test fee set by the Department of Transport is £54.85 for Class 4. HC MOT & Service only charge £40.00 for our MOT’s with a Service or £49.95 without. We also offer a free Re-Test if your vehicle fails on anything, as long as it is within 10 working days. Outside of the 10 working days, unfortunately, the law states that your vehicle would require another full MOT Test. The MOT certificate confirms that at the time of the test, without dismantling it, the vehicle will meet the minimum acceptable environmental and road safety standards required by law. It doesn’t mean that the vehicle is in a roadworthy condition for the length of time the certificate is valid. The MOT certificate is also no guarantee of the general mechanical condition of your vehicle. The test doesn’t cover the condition of the engine, clutch or gearbox. The first MOT test for a vehicle is required when it’s three years old and is due every 12 months therefore after. Remember an MOT test does not substitute or replace a Service. As an example the tyre below on the right will pass an MOT but very soon after the test, for example, 150 miles later, the tyre will be illegal for road use and if you are stopped by the police or The Department of Transport then this illegal tyre could cost you 3 penalty points on your licence and also a fine up to £2500 per tyre. In theory with 4 illegal tyres on your vehicle, you could be facing 12 points on your license and a £10,000 fine!! Don’t worry we can still service and repair your vehicle even if it’s still under the manufactures warranty. In 1995 the European Union introduced ‘Block Exemption Regulations’. This means your vehicle does not have to go back to the Main Dealer for any Service or Repair work, this could save you up to £70 per hour. For a full explanation on Block Exemption Regulations, please click on the AA website link below. Cambelts (Timing Belt) control the engine valve cycle sequence to ensure correct fuel combustion, timing and compression. Most engines are designed in such a way that should the cambelt timing move or the cambelt snap, this would allow the pistons to hit the valves resulting in piston and valve damage requiring an engine rebuild with new pistons and valves. Cambelts should, therefore, be replaced at the correct service intervals; especially on interference (most diesel) engines as belt wear causing incorrect timing may result in a very expensive repair bill. 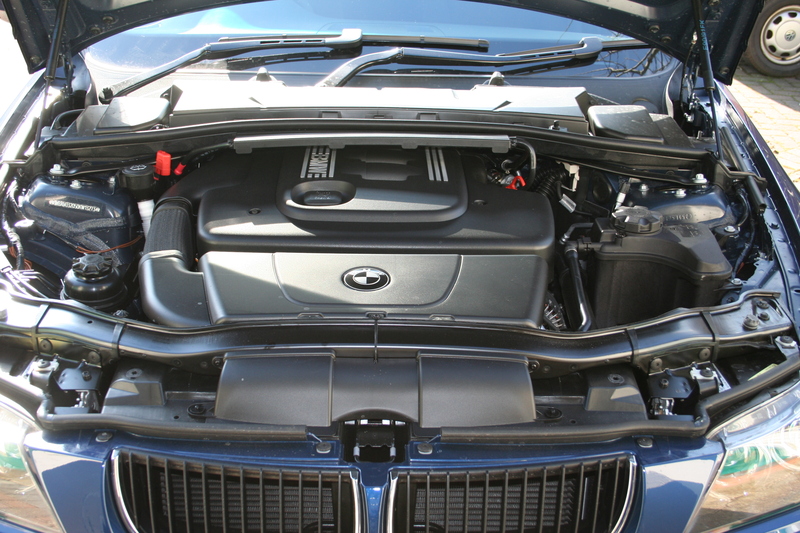 Timing belt replacement involves synchronising valve and piston positions and setting the adjustable tensioning roller to ensure the belt is not overtightened, putting additional strain on the camshaft and crankshaft bearings. Correct adjustment of belt tension is absolutely critical. The lubricants, hydraulic fluids and anti-freeze chemicals used within the engine can degrade the rubber polymer compounds used in timing belt manufacture. As a consequence, the belt life can be greatly reduced, especially if exposed to increased operating temperatures. Please be aware that doing your own cambelt can be very costly if you get it wrong. The camshaft timing only has to out by 6 degrees on some engines. This is enough for the valves to hit the pistons thus resulting in an engine strip down to repair. Please call us to discuss you cambelt requirements. We will give you good honest advice on what to do next.